The Reassertion of Sovereignty in The Great South Land, now known as 'Australia'. 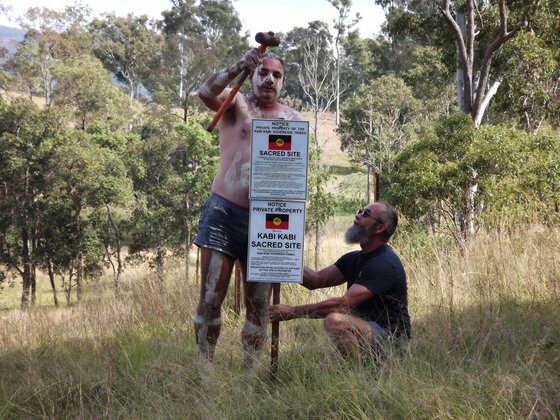 Picture above: Led by Wit-boooka, on the 26th July 2015 the Sovereign Tribes of the Kabi Nation of South East Queensland, reasserted Sovereignty over our sacred lands, and sacred sites, in order to protect them from fraudulent sale and destruction. © Wit-boooka and the Sovereign Native Tribes of the Kabi First Nation State 2015-2019. © Diane of Djaki Widjung 2015-2019. Material on this website remains the property of the individual creators, and cannot be reproduced without express permission of the original Sovereign tribes, authors, and image makers.